We have one final spy report for tonight. 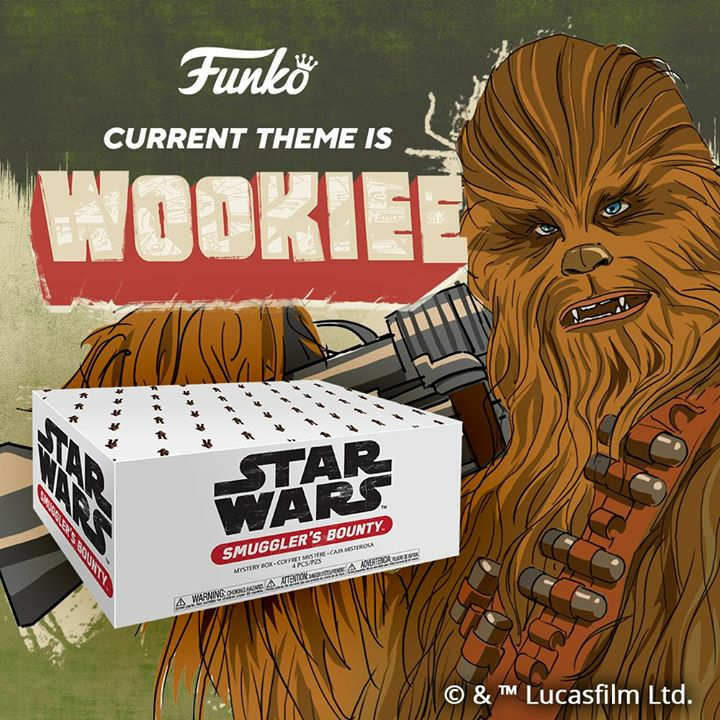 We’ve received info that limited edition “chase” foil packaging (similar to the Ultimate Galactic Hunt cards from the TSC and TAC line) is returning with the Vintage Collection. Here is a list of the first figures with variant foil cards which will be slotted into the cases for the ROTS wave (wave 2). Our Yakface spies have come out in full force this holiday weekend with several juicy scoops revealing several new products for Vintage and Clone Wars line. Today’s update reveals a new vehicle assortment that includes the leaked Clone Swamp Speeder and Hyena Bomber but also shows that the AT-AP Republic Walker is going to see re-release as well as a repainted AAT. Our Yakface spies have come out in full force this holiday weekend with several juicy scoops for the Vintage line. Here is one breaking down the Return of the Jedi theme wave (wave 3) and the Attack of the Clones wave (wave 4). Our spies have sent in another report today, this time revealing the two other vehicles that are receiving the variant black and silver “Vintage” packaging similar to the treatment the new AT-AT is receiving. They are TIE Fighter (w/small wings) and the snowspeeder. Look for these two exclusives this September. New Yakface forum member Timh603 has just added one heck of a display piece to the diorama section in the forums. You don’t want to miss this – click on through and enjoy! StarWarsShop.com today has launched a sale of their own where starting on Sunday at 12:01am PST, shoppers will receive 10% off all in-stock products through the end of Memorial Day Monday! Simply add your favorite products to the shopping cart, proceed through checkout, and StarWarsShop will apply the 10% discount to each in-stock product during the last step of the checkout. The have a lot of new merchandise to choose from — from lightsaber chopsticks and Darth Vader iPhone cases to exclusive art prints and collectibles — we have something for everyone! VisitStarWarsShop.com today — and be sure to check out our great selection of exclusive art prints, including four U.S. exclusive canvas prints by ID Wall! Hasbro has also launched an inventory clearance promotion of sorts where if you by $25 worth of qualifying Star Wars merchandise, you’ll get your choice of a free Captain Rex Helmet or Dual-Action Role Playing Lightsaber FREE! Head to Hasbro.com for the full details! Promo valid May 28 (today) through July 31. HasbroToyShop.com is running a Memorial Day Sale starting today and running through June 6 where you can save up to 50% off Star Wars and other merchandise. There are some great deals to be had so give them a look. Our Yarkora spy from the outer rim has sent us a bit of info revealing/confirming the return of the Ultimate Battle Packs! So far details are minimal other than an individual item number (20850), but stay tuned as we try to gather more intel. 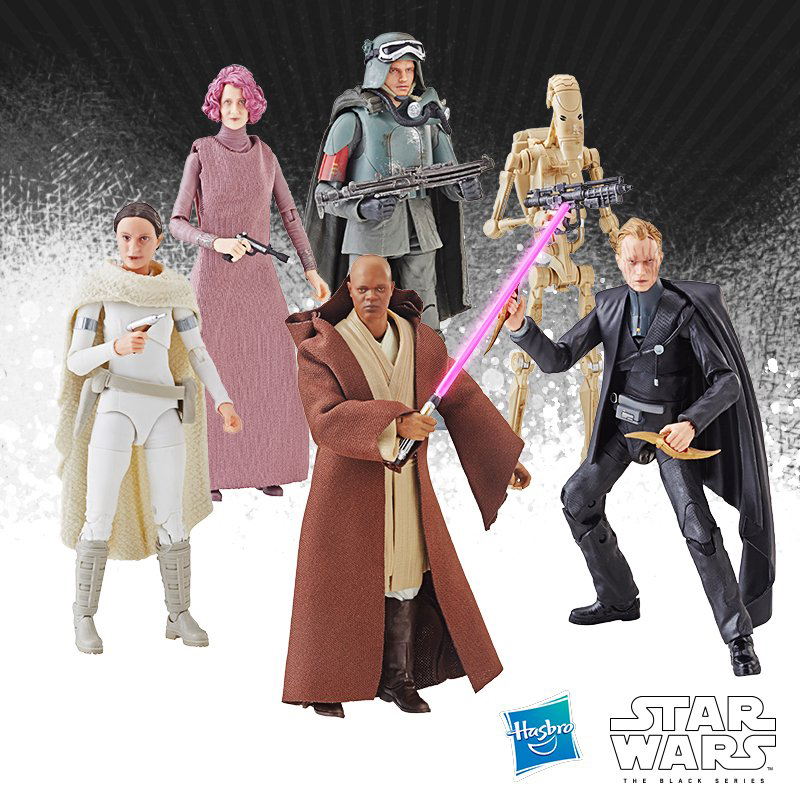 Entertainment Earth has updated their pre-orders for the Vintage Collection wave 2 with images showing off the new Anakin Skywalker/Darth Vader, Darth Sidious, General Grievous w/Cape and Sandtrooper. They also updated their listing for The Clone Wars wave 3 showing off super-articulated versions of Mace Windu and Kit Fisto along with the Clone Scout and Battle Droid Commander. Head over to Entertainment Earth for a preview of these waves. The Official Site has updated to announce details for The Clone Wars Season 2 DVD & BluRay. Head to StarWars.com for the full scoop. The October 26 release date also coincides with the launch of The Force Unleashed II here in the US. Thanks to Twitter poster Brad M. for the reminder. From now until Friday – save 15% on everything except ‘New’ and ‘Preorder/ Backorder’ items. Thousands of items are in stock and the sale applies to all Toys, Graphic Novels, Vintage Items, Statues, Busts, and other Collectibles. Simply browse through your favorite menus on the site to take advantage of this limited time sale pricing. We were able to buy up a variety of older inventory from the three companies mentioned above. Over 100 various items are now in stock, some for the first time ever and some back again for another round. There are a bunch of 1/6 Scale Check it all out all the latest here. Over the weekend, Medicom Toy revealed their next set of carded figures for 2010 which will be available at the Parco Medicom Toy Exhibition ’10 this June. This set consists of C-3PO, Han Solo in Carbonite Chamber, AT-AT Driver, Lando Calrissian, Wicket and Jawa and is limited to 600 pieces. The Official Site has updated tonight with a sneak peek at the Lego Star Wars Brickmaster book from DK Books. This special instruction book includes over 240 Lego brick plus 2 mini figures to build 8 exclusive models not available anywhere else! Look for it this October. Head to StarWars.com for a closer look at the cover. Take advantage to the huge savings on selected in stock items through the end of June or while supplies last! Savings of up to 60% on certain items. Click on through to place your order for Star Wars statues, mini busts, maquettes and more! If you’re like me, you’ve been waiting for a comparison image between the POTF2 AT-AT and the upcoming all new version that will be available in a couple months. The wait is over. Blogging site,ToplessRobot.com has posted such an image and it is now spreading like wild fire across the various Star Wars forums. How it’s even possible for Hasbro to make this so big at such an affordable pricepoint is amazing, and is going to surely please fans young and old. The Yakface Toyguide updates resume today with the addition of the Spacetrooper: one of the last figures in the Legacy Collection’s Expanded Universe wave. PROS: Excellent articulation and far beefier than the original POTF2 version. CONS: Again suffers from “last wave syndrome”; forearm blasters don’t collapse into the arms. There’s so much new stuff this week! On the DC Comics side of things, we’ve got the recently announced DC Universe Classics 15 available for preorder. If you like your DC Comics figures a little weirder, then check out all our new DC Direct Blammoids preorders. And for all you classic TV and video game enthusiasts, we’ve got a triple threat of new preorders this week: Mega Man, A-Team, and Thundercats . Last but not least, we’ve got new Gentle Giant statues up for preorder, like the D’an mini-bust and the Bantha & Tuskan Raider statue. Check out the Past Generation Toys Blog this week too, which has lots of new posts and a brand new review style you’re sure to enjoy. Last Friday was the 30th anniversary of the release of The Empire Strikes Back. It is undoubtedly daunting to try and make a follow-up to the most successful film of all time, but George Lucas was up to the task creating a film that many fans actually consider superior to the original. Lando, Boba Fett, Carbonite, and Luke’s paternal revelation, all iconic images created with this second installment in the Star Wars saga. In celebration of this anniversary, Star Wars Action News brings you an extra-long episode full of your memories, your first time watching Empire Strikes Back on theaters or video, your favorite Empire toy, and more. And Jerry joins us with his favorite Empire collectibles, Nathan P. Butler gives us a retrospective of fandom and the EU when Empire was released, and Arnie reviews Alan Arnold’s Once Upon A Galaxy — The Making of The Empire Strikes Back. With the news of Lucas’ arrival at Celebration 5, some new collectibles up for pre-order, and Harrison Ford as an old man, it’s all this and more on this week’s Star Wars Action News podcast! The Yakface Toyguide updates resume today with the addition of K’Kruhk: one of the last figures in the Legacy Collection’s Expanded Universe wave. PROS: Excellent articulation and sculpt for a Jedi that spans several eras of the Star Wars universe. The removable cloak looks great on as well as off the figure. CONS: Suffers from “last wave syndrome”; no signature straw hat included. Production on the final installment in The Enloe Chronicles has begun, and part of the process as always is creating new aliens and other characters to populate the galaxy. Several new custom figures are complete, which can be seen here. Also for something fun, and assuming the character survives this long, check out forumiteDanOfTheDead‘s take on what this fan fic character might look like after the fall of the Empire in his customs thread. Our friends at Endor Express.net have once again scored all of the 411 on Disney’s Star War Exclusive figures. This time it’s the Star Tours Boarding Party set will be released today at both Walt Disney World in Florida and Disneyland in California. To score yours, check out all the info on Endor Expresshere, including the mail order numbers and sku numbers! It has just been announced that the creator himself, George Lucas will make a special guest appearance at Star Wars Celebration V this August in Orlando. This will be the second Celebration appearance, and only the third Star Wars convention appearance for the writer/director, who last attended Celebration III in Indianapolis, Indiana in 2005. Today commemorates the 30th Anniversary of The Empire Strikes Back, which for many fans serves as the best of the entire saga and what got them started on three decades of collecting. I recommend taking a couple hours today to watch it again, but when you do, unlearn what you have learned and try to view it with those fresh eyes from your childhood. Feel free to post your comments and memories regarding this milestone in our forums or onFacebook. As promised, Sideshow Collectibles has updated tonight and has revealed a special giveaway for a Life-Size Darth Vader Bust and a sneak peek at a 1:6 Scale Yoda! Head on over to register to win and view the production video. Gentle Giant is producing a statue of a Tusken Raider riding on a Bantha. This piece measures 12″ tall by 18″ wide and is listed at $224.99, saving you $25 off the MSRP. The leader of the Modal Nodes is being given his own mini bust, sculpted with his Kloo Horn. This piece is 1/6 scale and is priced at $53.99 $6 off the MSRP. New Star Wars Back Buddies have been announced. These pieces allow you to take your Star Wars pals wherever you go, and they can even carry your stuff. We’ve got Darth Vader, R2-D2 and Chewbacca listed at $44.99-$49.99 each, with the exclusive Bespin C-3P0 Back Buddy at $89.99. Wicket is now coming home in the form of a huggable 11″ plush talking figure. Give him a squeeze and get a “jub jub” in return! We have wicket priced at $29.99, and he should be arriving this August. This giant list is full of items from Sideshow, Hot Toys, Fewture and more, at discounted prices to due our special purchase. 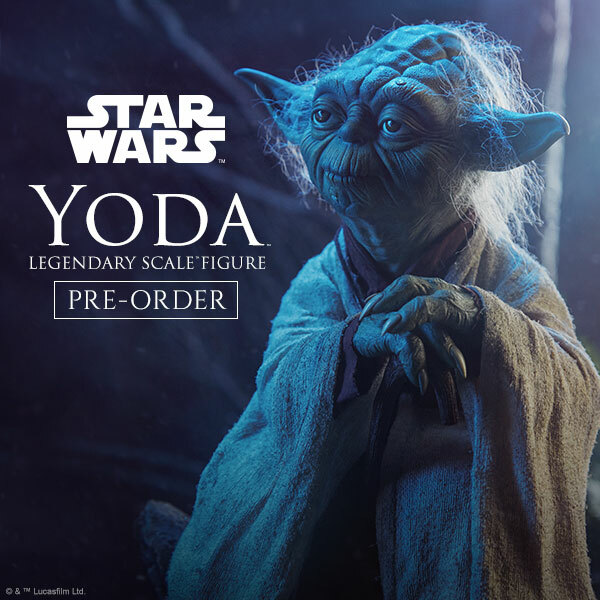 Check out the figures, like the 12″ Sideshow Star Wars figures, Hot Toys Movie Masterpieces of various lines, model kits, statues, prop replicas and more. Check it all out all the latest here. Acme Archives Direct has announced that for tomorrow only (May 21st), you can receive 30% offyour purchases by entering promo code ESB30 upon checkout! The discount comes just in time to purchase their latest piece: “Solo” by Brian Rood. Discout code valid at Acme Archives Direct only and not at any other affiliated site. Thanks to Scott from Tulsa for the heads up. Brian’s Toys: 10% OFF All Orders – International Orders Too! International customers have had the unfortunate chance of being excluded from the recent Free Shipping promotion currently being offered at Brian’s Toys. Plus, the slide of the Euro has made it more expensive for many customers. To rectify this situation, Brian’s Toys is offering a 10% Discount on all orders placed at brianstoys.com. Take advantage of this promotion by applying the promotional coupon code “TENOFF” at check out, and your order subtotal will see a 10% discount. This offer can be used by domestic customers as well, but cannot be used in conjuction with the Free Shipping offer. Offer expires June 2, 2010. For a few months now, our friends at JediDefender have been running a nostalgic feature in their forums entitled “Collect All 92!”, showcasing comparisons between the original “Vintage” Kenner action figures and their modern day equivalents. Today’s feature continues with the Power Droidwhich wraps up the last of the A New Hope figures. Head on over to JediDefender to check it out. In celebration of The Empire Strikes Back’s 30th Anniversary this Friday, look to their site soon for a special “Dark Side” giveaway and cool Star Wars Production Peek! 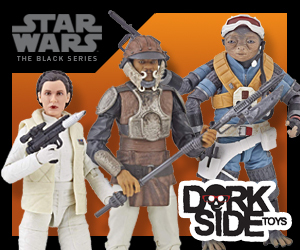 The Yakface Toyguide updates resume today with the addition of the Dark Trooper: the first of the last figures in the Legacy Collection’s Expanded Universe wave. PROS: Excellent articulation as well as overall sculpt which captures the look and feel of the Dark Forces character. CONS: Suffers from “last wave syndrome”; hose on vibro-sword hinders range of motion for right forearm. Our friends at Sandtroopers have been posting coverage of their presence at Motor City Comic-Con this past weekend. Head on over to vicariously attend the show! The brickmasters at Eurobrick.com have posted a new images today revealing a Special Edition Clone Wars set featuring Cad Bane’s Speeder (8128). This set, coming exclusive to Target, contains 318 pieces and include mini figures of Cad Bane, the Assassin Droid, Shahan Alama, a Senate Commando and Senate Commando Captain* (aka Captain Jayfon). Click the image above for a closer look. *Could this be the same Senate Commando Captain included in the rumored Senate 2-pack we posted this past weekend? Time will tell but I’d bet yes. Blackest Night, Clone Wars, Alice, & Halo Reach New at PGT! We have lots of new preorders at Past Generation Toys this week. First up is DC Direct’s hit new lineBlackest Night, with figures up for preorder from across the rainbow and from Series 1 to Series 8. Next up are Star Wars: The Clone Wars figures on cool new cards. Don’t miss your chance to guarantee yourself these releases now! Medicom’s new Ultra Detail Figure (UDF) Alice in Wonderland figures are shipping soon, and you can preorder both Alice and the Mad Hatter now. Finally, we have new Halo Reach releases up for preorder, including singles and awesome new vehicle sets from the upcoming game. While this month Empire Strikes Back is hogging the spotlight what with a StarWars.com site redesign, a Wampa rug, and Cloud City C-3PO backpack, it’s little brother Revenge of the Sith is turning 5 this month and to celebrate the staff of Star Wars Action News reflect on the final film in the Star Wars saga, recounting their experiences first watching the movie, Nathan P Butler joins us to reflect on the movie’s acclaimed novelization, and Arnie and Marjorie review their favorite Revenge of the Sith collectible. Also they review a new Revenge of Sith Collectible–the Sideshow Yoda and Clone Trooper Premium Format Figure! Also this week, Marjorie talks to Ashley Eckstein, voice of Ahsoka Tano on the Clone Wars and founder of the Her Universe Star Wars clothing line for girls, Marjorie and Arnie explain why you HAVE to go to Celebration, and we review the figures in the Force Unleashed multi-packs. All this and more on the latest Star Wars Action News podcast! Forumite julianmaurice strikes back with the second installment in his latest photonovel series, X-WING ALLIANCE – The Adventures of Ace Azzameen. Check it out in the forums after the jump! 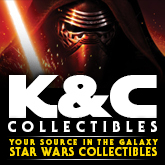 K & C Collectibles has received Clone Wars, Comic Packs and Force Unleashed figure packs this week. Click through to see the complete list of updates. Our friends at Jedi Temple Archives have posted this morning that Target, not to be outdone, has placed their basic figures on Temporary Price Cut down to $4.99 matching Toys”R”Us and Walmart in their “Order 66” of current Star Wars merchandise. Some great deals to be had out there folks. Don’t miss them! Our spies behind the scenes have passed on some new product info again along with additional details regarding items we revealed previously. The new info includes estimated release dates as well as SKU numbers. Click through to read the full breakdown. This weekend we bring you another Customizer Mega Spotlight with some more great custom work from Yakface forum members. Leading things off is forumite I-am-Boba-Fett, who has sculpted an amazing Selkath Jedi – check out his latest work here. Next, be sure to check out some great new customs, including a realistic styled Cad Bane courtesy ofdarth naes. Customizer Michael also strikes back with a variety of his own work, including a really cool Yarkorafigure. Finally, you don’t want to miss out on the latest from LadyIrithyl, who has created something that we hope Hasbro soon takes notice of – Obi Wan Kenobi from the Obsession Comic. There you have it. How does this answer sit with you? Make your thought known in the forums. Hasbro was kind enough to officially release the latest Star Wars product images for your enjoyment. You can view the complete photo album of Vintage, Saga Legends, Clone Wars figures, vehicles, battle packs, Transformers, Role Play items and more on our Facebook page. Sideshow’s 12″ Star Wars line will now be releasing the Popular Captain Rex, Anakin’s second in command. This figure will include standard weapons and armor, and is listed at $114.99, $10 off the MSRP. Check it all out all the latest here. HasbroToyShop.com has sent out there latest email blast offering 20% off most purchases, plus FREE Shipping. Simply enter FREESHIP20 at checkout. Offer expires May 23, 2010. We have a special show with some special guests hosts taking up the mic this week on Star Wars Action News. On this week’s show we talk about the end of the Hyperspace membership as we know it, the latest Celebration V perks, the Sideshow Captian Rex figure, plus other Star Wars gaming and collecting news from the internet and the store aisles. Steve checks in with a UK Collecting Report from the Star Wars Fan Fun Day. Finally Sith Lords of Cincinnati take you along on a massive 10 store toy run to find out what they are finding. All this plus your voicemails on this weeks Star Wars Action News! In case you had not noticed, there’s a lot of older Star Wars product suddenly showing a promotion sticker with the chance to win tickets to Star Wars Celebration V. Share your thoughts on this developing story and read how the chances for winning may be stacked against you in the forums. Special thanks to forumite stroebel83 for providing photo evidence of this. We have over 25 brand new Star Wars figures available for preorder, so don’t miss all these great new toys, like the 2010 Saga Legends and Expanded Universe Build-a-Droid waves, and the new Black and Silver Vintage Collection. There are lots of new G.I. Joe figures available as well, including the latest G.I. Joe Convention exclusives and preorders for upcoming Pursuit of Cobra figures. These won’t last long, so be sure and order now! 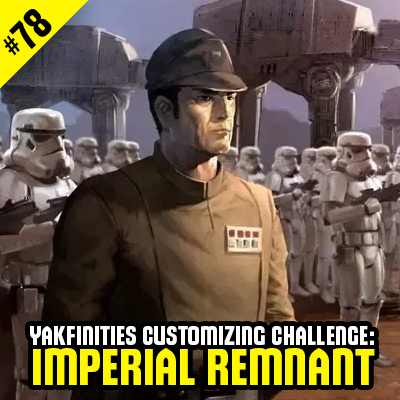 The Roundup Report is finally here for the most recent Customizing Challenge – and with nearly 40customs made for it, it marks one of the biggest Yakfinities to date! Check out all the action and see who the three random winners are after the jump! Sandtroopers full scale assault on Hasbro continues with the revelation of Kul Teska from the Clone Wars: Republic Heroes video game. This confirms a rumor Rebelscum posted back in April. Look for him only at Toys”R”Us later this year. After viewing, let us know what you think about this news inour forums. Adding to their repository of first look images from over the weekend, the Sandtroopers Forum have posted the first look at the packaging for the highly anticipated Jabba’s Throne with Oola courtesy of forum member “Gorkoracing”. The packaging reveals that Jabba will have a posable tail and the set will be exclusive to Walmart. Head on over for the sneak peek and after viewing, let us know what you think about this news in our forums. Tonight we spotlight the launch of an all new photonovel series by forumite julianmaurice called X-WING ALLIANCE – The Adventures of Ace Azzameen. Be sure to check it out after the jump! The Yakface Toyguide updates tonight with a detailed look at the upcoming Bounty Hunters 30th Anniversary Exclusive featuring Vintage deco versions of the modern 4-LOM and Zuckuss figures. PROS: The modern interpretation of these figures really invokes a sense of nostalgia for the Vintage Kenner line. 4-LOM (Zuckuss as we know him today) is the real star of the set with the lighter color and the thick vinyl soft goods. It’s perfect. Head to the toyguide for the full image gallery and “Yak Facts” to judge for yourself whether this set is worth adding to your collection later this year. Toys”R”Us has updated today and has made available the hard to find (for some) EU wave. Get them while you can and thanks to Adam for the tip! Our friends at Sandtroopers.com have revealed an unexpected addition to the pile of figures coming out in the new line later this year – a new and much improved Jodo Kast! Head on over and check out what looks to be an upcoming K-Mart exclusive. Edit: This confirms a spy report we had posted back in January. Update: Forum member Gorkoracing has posted another image, over in the Sandtrooper forums, this time revealing the cardback. Head on over for a closer look. Not to be outdone by Toys”R”Us’ $4.99 price point for action figures, Wal-Mart has slashed their prices from $6.00 to $4.50. If there is anything you’ve been holding out for or wanted extras of… now’s the time. Who knows? Maybe the Plo Koon and Saesee Tiin armies will finally get cleared out as an added side benefit. 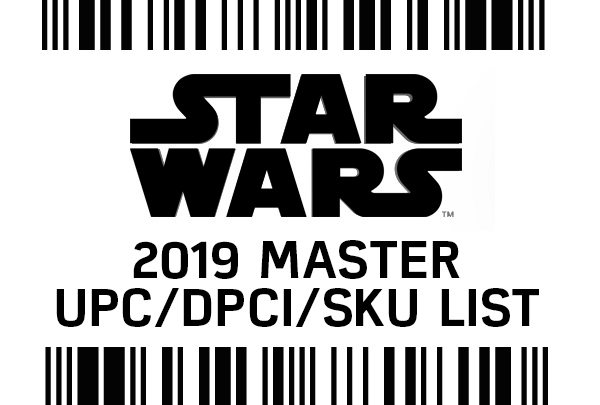 Coincidentally, after creating my own version a couple days ago, Hasbro has released the official Vintage Collection logo that we’ll be seeing on the back of those iconic 6×9 cards in a few short months. Click the image above for a larger version. We’ve now had a chance to list the singles for the two new waves of Galactic Heroes. You can choose from old and new favorites like Anakin & Ahsoka, Cad Bane & Aurra Sing, the Emperor & Darth Vader and the Mandalorian Two-Pack, priced at $8.99 – $11.99 each.. Check it all out all the latest here. Recently, Gentle Giant updated their site with 3 new items: The Kit Fisto Maquette (available Fall 2010. ), a Darth Vader Force Unleashed Mini Bust (available Dec.) and a set of Jabba’s Palace Bookends (available Oct.). These items are available for pre-order now through Gentle Giant’s website and from many of our fine sponsors. Place your orders today! Congrats to Rebelscum’s Dan Curto on the acceptance of his 100 Sketch Cards for Topps’ The Empire Strikes Back 3D Widevision Series launching this month. Maybe you’ll be one of the lucky collectors to snag yourself an original “Curto”. New Iron Man 2 and G.I. Joe Pursuit of Cobra Preorders at PGT!! Iron Man 2 hits theaters this weekend, and Past Generation Toys has all your Iron Man toy needs covered. Check out our Iron Man 2 Section for great deals on the first wave of figures, and then head over to our Iron Man 2 Preorders to find all the upcoming releases you’ve got your eye on. We just got back from the International G.I. Joe Collector’s Convention and we can’t wait for all the new Pursuit of Cobra figures. If you’re excited like us, check out our Pursuit of Cobra Preorders to make sure that you’ll be getting these awesome toys when they do finally come out! And as always, check out the Past Generation Toys Blog, PGT on Facebook, and PGT on Twitter. HasbroToyShop has joined Toys”R”Us in blowing out several of their Clone Wars and Legacy Collection figures for $4.99 each and Battle Packs for $19.99. Click the link above for to see what deals can be had. Thanks to EvilAnimation for the tip. Our friends at Sandtroopers have posted a new image gallery showcasing a few of the upcoming Saga Legends figure due on store shelves this August. I must admit the packaging does look sharp.Head on over for a sneak peek. There was a lot of frustration over the weekend as collectors around the country arrived at Toys”R”us stores hoping to find the Expanded Universe wave, and many went home empty handed. But just today , I went by a store that sold through their stock Saturday morning, only to have the pegs filled with them once again. So don’t give up hope just yet – you may very well find these in your area if you haven’t been able to score them yet. To celebrate May the 4th, the LEGO team has come up with a new LEGO Star Wars Mini-Movie tell the story of the Original Trilogy and has posted it on YouTube. Check it out. Can a sale on action figures not only help your wallet but change your worldview? The answer is “yes!” This week on Star Wars Action News, Marjorie and Arnie reflect on the insane sale on Star Wars figures last week at Toys R Us, and discuss not only how it allowed fans to stock up on figures at better-than-2005 prices, but also how it gave Arnie a totally new attitude towards collecting. Also this week we preview Gentle Giant’s 2010 San Diego Comic Con Exclusive Mini-Bust, the third in StarWarsShop.com’s Empire Strikes Back 30th Anniversary art collection, and Sideshow’s new Captain Rex figure. With a Hasbro Q&A and more, it’s all this week on Star Wars Action News! The latest Customizing Challenge here at Yakface has begun! For more details, head on over to the forums. Also, be on the lookout for the Roundup Report for Yakfinities #34 later this week! Tomorrow, in celebration of “May the Fourth Be With You”, Borders book stores (and throughBorders.com) will be selling a set of Limited Edition Star Wars Logo Bookends created by Gentle Giant. Cast in high-quality polystone and then hand painted, each bookend is numbered and comes complete with a matching limited-edition certificate of authenticity. Our friends at Rebelscum have posted a new rumor report that speculates on a few upcoming figures and battle packs for 2011. Head on over to see what it’s all about. Remember, nothing is official until Hasbro says so. Looks like those that ordered the Force Unleashed figure packs online from Toys”R”Us might be in for a rude awakening once they receive and open their packages. We’ve received reports that even though folks ordered one or multiple of each set, their order were filled with 2 or in some instances four of one set. Yakreader and forum member “baghutch” ran into that very scenario with his order. Hopefully these errors are isolated incidents maybe if a few of you run into this you can get in contact with each other via our forums and work out an exchange. The folks at clonelegends.com have scored some pics of upcoming Clone Wars figures coming out later this year that show off the packaging – and apparently these have already shown up in the Philipines! After you’ve checked them out at their site, share your thoughts in the forums. One of the coolest vehicles in the Star Wars universe is getting a major upgrade! This huge new playset features a variety of opening doors and storage for many 3.75″ figures. We have it priced very competitively at $109.99 – take a look . This line will feature awesome retro packaging and a slew of figures very similar to releases from the late 70’s. These will be great display pieces when left in the package – take a look at all the figures here – $104.99 per case & available singly. SO MUCH MORE NEW HASBRO!! Another round of new Animated figures has just arrived. This wave includes: Commander Bly, Anakin Cold Weather, Commander Stone, Magnaguard, Obi-Wan Cold Weather, Rex with Heater Pack, Firefighter droid. Check it all out all the latest here. This morning I waited at a local Toys”R”us for 30 minutes before they opened, hoping this would guarantee that I wouldn’t miss out on the Expanded Universe wave. Some other collectors in my area had the same idea in mind, and by 9:01 AM, all eight cases of the new wave were sold through (minus the repacks of course). We’re curious to see how everyone else did this morning? Share your experience after the jump! UPDATE – So far reports are coming in that a LOT of collectors came home empty handed today. We’re very sorry to hear that, and the complete frustration that so many collectors are feeling right now with how difficult this great wave of figures is turning out to be so far. Hopefully Hasbro is aware of this and will find a way to make these figures more attainable someday if Toy”R”us stores don’t get enough in to meet the demand for them.